The non-venomous reptile had "dyed itself a slight tinge of blue from the cleaning products", the RSPCA said. The charity believes the snake, which the homeowners have called Kevin, is someone's missing pet and hope to reunite it. 'Kevin' made his presence known by knocking over and smashing a lit candle in the couple's home. "My partner... saw the snake which hissed at him, then backed away into the toilet," Naomi Burdett said. 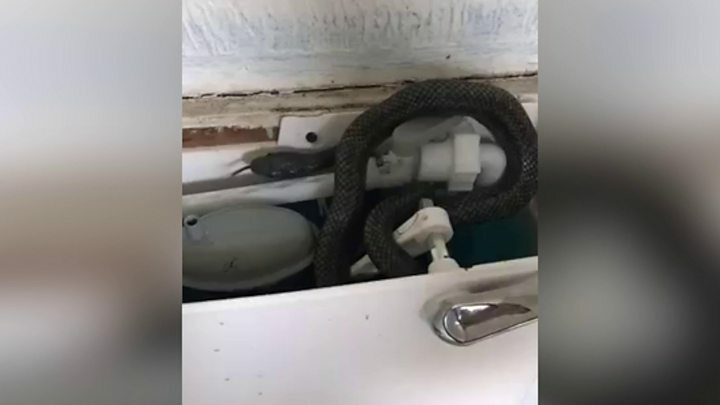 "He ran upstairs in a moment of panic - neither of us are the biggest fans of snakes and it's not exactly what you expect to see in your downstairs loo." It was "bizarre" to see a snake peering from the porcelain, Ms Burdett said. However, as evidenced by Kevin, all snakes are "good escape artists", the RSPCA said. The snake had posed a "wee problem" to the homeowners, the spokesperson for the RSPCA added.